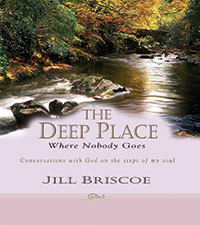 I have learned much from Jill Briscoe. I originally heard her at a Just Give Me Jesus rally with Anne Graham Lotz. I was deeply moved by her intimacy with the Lord. She read Him poetry and spoke to Him in such a tender and beautiful way. This is a book full of poems and stories about her journey to the steps of her soul, to the deep place where nobody goes. I read this a little at a time. Some poems I have read over and over. It has deeply ministered to me and reminded me of the simple childlike faith we are to come to our Father with. Of course He will enjoy our poetry and songs. May you come to delight in God again, or for the first time. Try taking a pen and paper to the Deep Place where nobody goes. Then you can read His letters in the Golden Book and write a reply. So I write it out on paper and I get my feelings out. And He takes my piece of paper and He turns it into a prayer. And I cry for stern believing and I seek for power to cope. And then He leads me upwards and onwards in the night. So I hate to leave the Throne Room for the shallow place above! He settles my soul, and I listen to love.